When you are preparing for a potential disaster, the type of flashlight you buy can make it or break it. Most people think all flashlights are equal. If it shines pretty bright and is fairly durable, it will get the job done in any situation. This way of thinking, however, is foolish and potentially deadly. and at your bug out location. Plus, burying a few at the bug out site and your home isn’t a bad idea. You can never have too many sources for light. In a crisis, losing your sense of vision will greatly reduce your chances of surviving. Do not let this happen to you. 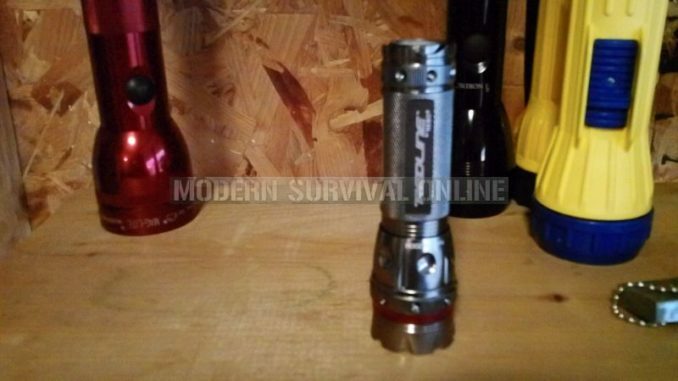 Read the guide below to learn what to look for when shopping for a survival flashlight and find the right one for you. The first thing to consider when shopping for a flashlight is the different ways you will use it. The type of tool you’ll need at a campsite will be different from the one you’ll need during a power outage. The flashlight at your bug out location should be durable, water proof, and able to handle a solid amount of impact. In the best-case scenario, it should even be able to function well as a baton-like weapon. There are even tactical flashlights that come with weapons like Tasers from Vinertek. For the flashlight used in a power outage, brightness and battery strength are key. The only way it can be damaged is an inadvertent drop, so the durability of the tool is much less important. The goal is simply to provide a large amount of continuous light. The two devices described in these scenarios perform the same function of providing light, but they have very different designs. Add additional types, like a small travel flashlight for the car, and you will see why multiple batteries and flashlights are needed in a crisis. They all provide light but can serve different functions in your plan. Hand Crank, Primary or Rechargeable Batteries? There’s no consensus of opinion among the prepper community on this one. Try different kinds prior to a crisis and figure out which one you think works better. For primary batteries, look for the lithium variety. Alkaline batteries may be extremely easy to find but they have a short shelf life and tend to leak. Lithium can last five years without losing any of its charge but they are not rechargeable. Their usefulness dies with the battery. Rechargeable batteries also come in two varieties. There are Li-Ion (lithium based) and Ni-MH (nickel based). The Li-Ion has a stronger shelf life. However, the Ni-MH is starting to gain a following due to the fact that it can work with batteries that are similarly shaped to the alkaline primary variety. It’s easier to find a flashlight that accepts the Ni-MH batteries, which is a problem for Li-Ion rechargeable varieties. Another option is a crank-powered flashlight. In theory, these will never lose power. The beam can be a bit weak, but it is a great backup plan just in case. A large flashlight should be able to easily illuminate an entire room. Anything less, and you’ve wasted your money. It should also come with a top handle. If the light is small enough to easily hold with your hand, it is too small. The bulk of large flashlights can make them too hard to carry in the wilderness, but they make a great permanent light source at camp. A medium sized flashlight will be the best for travelling. It won’t be hard to hold, but it will still be durable enough to take some hits. Don’t expect to use these for stationary light though. The beam shouldn’t be expected to cover too much area. Small flashlights come in a wide variety of sizes and can be as small as a key chain. No matter what they should easily fit in your hand. Use these for looking in small crevices or doing maintenance on machines. The beams can be surprisingly bright. Don’t settle for a weak light just because it’s a small tool and remember to pack a quality light in your EDC kit. Most flashlights you will find in stores are made out of plastic. They are usually fairly affordable and lightweight. It is not the best material for a survival flashlight though. Plastic is not durable and will break easily under stress. Even dropping it could cause a crack. This is the best material for a survival flashlight. The rubber will keep it waterproof. Plus, typically, the rubber is just an outer coating on an aluminum skeleton. It will be very durable. The only downside is it may be a bit heavy. If you can’t find a rubber flashlight, this is the next best bet. They will be more expensive than the plastic variety but infinitely more durable. As a bonus, the metal exterior will make these a better club than any of the other options. There are two different bulb options to choose from. The first is the classic incandescent bulbs. The second is the newer LED lights. LEDs shine brighter and without the yellow tint typically found with incandescent bulbs. Plus, they don’t take up as much battery power. However, replacing them can be costly so keep that in mind when making your choice. The only real advantage of incandescent bulbs, aside from cheaper price, is that they have a stronger beam. Up close the two bulbs have equal power. However, LEDs don’t shine quite as far. I would argue, however, that the yellow tint undermines this advantage. You can see farther but not clearly. Here is a list of quality flashlights. These can be found on Amazon, if you can’t spot them at your local store. The beam this flashlight produces is impressive. Its power is usually reserved for models at three times the price. This is a favorite of the military, police, and fire department because it’s easy to carry despite its jolting light. It has multiple settings to reduce overheating. If left at full power too long the military-grade aluminum handle can heat to 150 degrees. The metal casing makes it a great weapon as well. Plus, its designed to be rail mounted on an AR-15, shotgun, and other rifles. This is great primary flashlight. It doesn’t serve every purpose. It’s of medium size so it won’t illuminate a large area and can get pretty hot after a while. It’s perfectly designed to help you while walking through the woods at night, though. The Emergency Crank Flashlight is a great backup option. It’s designed to work as a light but also as a seat belt cutter, window breaker, red flasher, and compass. Plus, it’s not reliant on batteries. Just turn the crank or use the USB drive. There are better products on the market for pure beam power and ease of travel, but this device will be a key addition to your survival kit. It does a lot of jobs and won’t break down on you. This flashlight is specifically designed for personal defense. To go along with that, it’s basically unbreakable. It has no filament to break and can light for up to 1,000 hours at a time. The aluminum body is aerospace-grade. I doubt anything you encounter will damage metal more than falling through the atmosphere. There’s a 120 lumen bright flash designed to blind an attacker. If they can get past that, the tool has built in aluminum teeth to use as a striking weapon. Despite all these feature, it’s not bulky and it is easy to walk around with. There are stronger light sources, but this one has an impressive amount of accessories. This is a great tool for spying from a distance. It has a powerful beam that will shoot through the night and illuminate deep into the wilderness. There is a spot mode that allows you to focus on varying distances. Typically, a flashlight won’t be too tough. It’s not expected to see much action. That’s not good in a survival scenario. This tool is different. The LED light is unbreakable and even water resistant. It serves a pretty specialized purpose but this item is beautifully designed and will be very helpful as a secondary flashlight. The Fenix Tactical Flashlight is a great small option. It is less than 5 and a half inches but produces a great deal of lighting power. For 50,000 hours it will run perfectly and can reach up to 1,000 lumens for about an hour. Battery replacement will be a necessity. That’s about the only inconvenience on this device. It is water proof and its stainless steel sides can take a beating. If you combine this with the Vizeri above, you’ll have a great one two punch for night travel. The Surefire P2X is another small flashlight option. It serves a slightly different purpose from the Fenix PD35. It spreads a wide beam at 500 lumens. This essentially makes it a pocket-sized searchlight. If you have small children that could get lost in the woods, this is a good option. Its spread is gigantic. Plus, it is designed to take a beating, but not quite as much as the Fenix. The battery has a 10 year shelf life, and it comes with lifetime warranty. The Surefire company is high quality. The founder, Dr. John Matthews, actually created the first laser sight for law enforcement in 1969. Ever since, they have been cranking out quality lighting products. The Streamlight Survivor is a cutting edge tool. It uses the most up to date C4 power and LED tech. It is designed for easy use when wearing gloves, which makes it a good cold weather option. Plus, it can easily link to a belt or strap, making it a favorite for law enforcement. Amazingly, its advances in technology give a 50,000-hour shelf life. The beam is slightly weaker than other option at 140 lumens, but it is as durable as they come and water resistant. At 1317 lumens, this flashlight produces a blast of light that can be manipulated from a wide spread to a focused light. It comes with a lifetime warranty and is made of rust resistant aluminum, which will be helpful in moist environments. Not to mention, it is water resistant. On a clear night, this baby can shoot a beam light clean across two football fields. Its uses are a bit limited. It only takes one battery, but will only last about an hour before needing to be changed. This is simply flashlight for spying deep into the wilderness or scoping an area piece by piece. For that purpose, it’s great. This is the best pen light on the market. It easily clips to your pocket and has three levels of light. Weighing in at barely over an ounce, it’s a great tool to throw in your bag and use in emergencies. Just make sure to note that it takes a triple-A battery, which is not included in the original purchase. The UltraFire 7w is made to fit a lot of different scenarios. Its focus is adjustable, allowing you brighten areas both up close and from a great distance with equal precision. The clip is designed to fit right on your belt. This makes it a favorite for rock climbers and mountain hikers alike. Plus, it takes a variety of voltages. You won’t have to search for a battery to fit this machine. All will do the job. It’s a small flashlight that has big versatility and power. You definitely won’t be left in the dark with this device. It blasts light at 1,200 lumens and has five easy to adjust settings. Just a click of a button and the focus will move from a wide spread to a focused search strobe. There’s even an SOS mode for use in extreme emergencies. It’s made of plastic, but it’s the hardest possible on the market. It won’t crack without extreme stress. Plus, it’s waterproof. You will need to purchase (3) AAA batteries for this device and a charger for continued use. Smith & Wesson is a household company name and it’s a favorite for law enforcement officers, military men, and even astronomers. It has a special red light mode you won’t find on many other devices. Red light is great for illuminating the woods at night. It’s harder to track the source of the light and more effective overall. Its normal white light mode comes with 13 LED lights that can run on full blast for 30 hours at a time. The flashlight can illuminate at distances up to 17.1 meters. The red light mode will shine to 16.5 meters and can last up to 80 whole hours. The Protac Tactical Flashlight is a great small-sized option. Its C4 LED works very well and packs a great deal of power. There’s no doubt that it’s one of the brightest small tools on the market. Plus, it is durable. Its waterproof and proven to survive falls from 2 meters or below with absolutely no malfunctions. Weighing in at 2.8 ounces, it won’t be a burden whatsoever to pack one of these as a quality back up. This light comes with a complete rechargeable system. It is a bit on the pricey side but it will last and last. You will only have to buy a new battery about once every decade. The investment is a good one. Plus, the light itself is high quality. It’s made of aluminum and its halogen lamp is extremely powerful. If you can deal with the dent in your wallet, this light will last so long and perform so well that you’ll be passing it on to your kids. As you can see, there’re quite a few flashlights to pick from but the ones I highly recommend are the hand-crank type because they’re guaranteed to work when there’s no electricity. Excellent and informative article. You brought up many important things you need to consider when choosing a flash light. Well done. I like Surefire and Streamlite. I also have the wonderful Peak MaxaBeam xenon arc. As you mentioned 3-5 cell Maglites make wonderful clubs. Keep in mind that a LED is a light emitting diode. A diode is a semiconductor, potentially vulnerable to EMP. For that reason, I keep an incandescent bulb in the base of my LED Streamlines. It is easy to wrap this bulb in a thin sheet of foam rubber and then wrap the foam with tin foil – an added protection against both emp and mechanical shock. another point about LED vs incandescent bulbs is that Incandescent bulbs pierce smoke/fog far better then LED flashlights. You can run LED flashlights on batteries that are weaker vs incandescent bulbed lights. A good ‘retreat’ light is the old 6v lantern like the Rayovac LED – tested one and a single 6v battery ran for 6 days straight before it really became noticeably dim. By placing a resistor inside it, you can get even longer run times out of it at a slightly lower lumen. You can also get rechargeable 6v batteries AND a adapter that takes 4 D batteries, but you can also use the eneloop adapters to downsize into C or AA batteries but have shorter run times. And for what it’s worth, 1) I absolutely hate these stupid flashlights with multi-mode settings where you have to cycle through them to get the light you want. 2) cheap flashlights are just that – cheap, 3) keep to common batteries sizes instead of having multiple battery sizes. Only my firearms have the CR123 batteries, 90% of everything else uses AA or AAA batteries or have adapters to use AA batteries. P.S. the thing that made this site good when Rourke ran it is that it was more personal, not these canned analytical posts that you can see everywhere else. Add some of your own personality to it, treat it as if you’re talking to a friend or group of friends. Dan , thanks, a very informative article. Thanks, guys. Yeah, I will try to add some of my uniqueness (if you will) to the articles, the last two were written by someone else other than me. Right now I’m focusing on providing really good content. Thanks for sharing your personal opinions and experiences, they add a lot of value to the article! quite an extensive overview on flashlights. I have quite a collection from expensive tactical lights to Harbor Freight give a ways. The best is a Ade collimating green laser that opens up to a decent sized circle for ID. That said…I wonder about the necessity of light in SHTF……light will be your enemy. Collect ways to black it out as well as lighting. Throughout months of combat patrols in RVN I never had, nor had use for, any type of flashlight. there was always sufficient light to accomplish the job at hand. I have also been in places, deep in the everglades with overcast, that I could not see past my nose. In those conditions any light could save you from disastrous outcomes evolving your very life. Thanks for sharing your insight on your choices of flashlights, I personally prefer lights that have both the hand crank and batter option, it’s a dual purpose kind of thing. Any idea on which brands are light yet durable?